Director Bryan Singer’s returns to the “X-Men” franchise (he directed 1 & 2) with “X-Men: Days of Future Past,” a story (the seventh in the franchise) that picks up where “X-Men: First Class” (2011) and “X-Men: The Last Stand” (2006) left off. The first hour or so is inspired, the best of the franchise and about as good as any superhero film you will ever see. The final hour is a bit of a letdown, especially after the virtuosity of the first, but between the big action set-pieces and a ton of cameos, no one will leave disappointed. “Days of Future Past” opens with a spectacular action sequence set in a Dystopian 2023. In a Moscow destroyed by war, Iceman, Bishop, Colossus, Sunspot, Warpath, and Shadowcat (Ellen Page) skillfully hold off a troop of marauding Sentinels — part machine, part mutant sentient robots tasked only with exterminating Mutants. Eventually, though, these determined killers prove to be unstoppable and all but two of our heroes are killed — but only temporarily. Shadowcat saves everyone through the manipulation of Bishop’s mind. She’s able to alter time by projecting Bishop’s mind back two days so he can warn the Mutant team of the inevitable Sentinel attack. This is how the group has managed to stay alive for some time now, but it’s apparent the Sentinels will eventually wear them down. In this world, the war between humans and Mutants and their human sympathizers has already happened. Using the Sentinels, the humans have won (a pyrrhic victory — the world is in ruins) and are merely mopping up the remains. Dr. Professor X (Patrick Stewart) and Magneto (Ian McKellen) have managed to survive and remain allies. Now they have a Hail Mary plan. The idea is to have Shadowcat use her mind/time-altering power to send someone back 50 years to 1973 and stop the event that kicked off the war: The assassination of Bolivar Trask (Peter Dinklage), the designer of the Sentinels. After an avenging Mystique (Jennifer Lawrence) murdered him, Trask became a martyr to the cause against the Mutants, and when she’s captured, experiments on Mystique give the Sentinels the morphing powers that make them unstoppable. The problem with the plan is that Shadowcat’s power is destructive to the human mind. She can’t send anyone back further than a month without killing them. If only there was someone with astonishing self-healing powers… In steps Wolverine (Hugh Jackman), who then wakes up in 1973 with the mission to convince the “X-Men: First Class” cast to get over their differences and prevent the war by stopping Mystique. If you’re getting a sense of “Terminator” déjà vu, visually the opening sequence accompanied by Dr. Professor X’s voice over will only increase it (the story is, however, based on a Marvel comic storyline written pre-“Terminator,” in 1981.). Moreover, as the time-traveling-to-stop-a-war Wolverine, Hugh Jackman’s finally added enough muscle to resemble a mid-eighties Schwarzenegger. Once we arrive in ’73, though, “Days of Future Past” is something all its own and thankfully doesn’t waste a lot of time with characters attempting to convince other characters that time travel is real and the future needs to be saved. From here the story is set up to entertain the fanboys more than the casual fan. The complications in the relationship between Dr. X (James McAvoy), Magneto and Mystique are explored, the mythology is expanded, and the history of the Vietnam War and even President Nixon come into play (though not in a partisan way). As a casual fan, this hour can’t live up to the previous, but the climax, delivered in two eras, sure delivers. The $200 million budget is all up on the screen in the form of dazzling special effects. Jackman is terrific and although he’s at the center of the story (and adds welcome doses of humor), Wolverine still feels underutilized. As does, Ellen Page, who is relegated to cupping her hands around Jackman’s temples for most of the film. 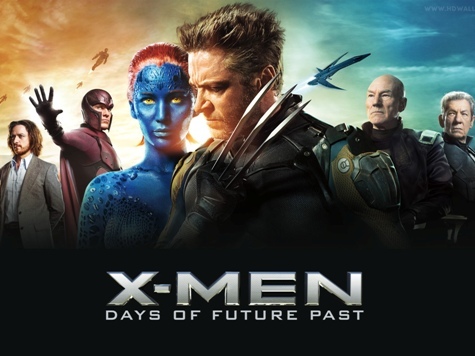 For sheer summer thrills, “Days of Future Past” is well worth a ticket purchase and is even an improvement over “First Class,” which also deflated a little after the first hour. I wouldn’t put it in the same tier as this summer’s two thrilling surprises, “Captain America: The Winter Soldier” and “Godzilla,” or even “X-Men 2,” but close enough. P.S. There is a post-credit sequence that sets up “X-Men: Apocalypse,” which hits theaters in 2016.